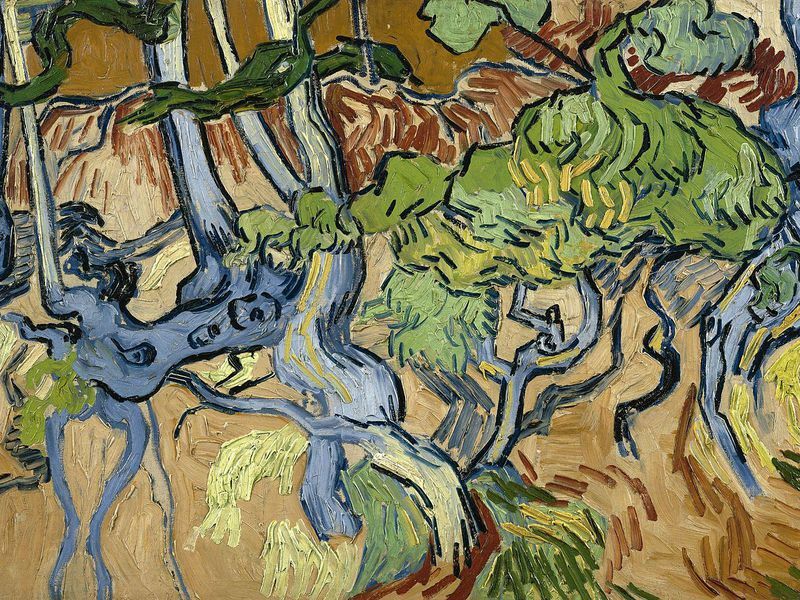 What do you see when you look at Vincent van Gogh's painting, "Tree Roots"? Why do you think people care which work of art was Vincent van Gogh's last painting? In the article, experts give differing opinions about whether van Gogh painted "Tree Roots" intentionally as a farewell. After reading their opinions and seeing the painting, what do you think? Why? In the article, the writer said the scene in van Gogh's "Wheatfield With Crows" screams tragedy because of the content, colors and short, quick brushstrokes van Gogh used. Think of another famous painting. How would you describe the mood in it? What evidence in the painting supports your opinion? Prior to conducting this activity, collect examples of famous paintings that students are likely to be familiar with such as Leonardo da Vinci's "Mona Lisa" or Edvard Munch's "The Scream." Display the examples for the class. Invite students to share what they know about each painting. Point out that famous paintings like these usually have a story behind them. For example, while much is known about da Vinci, little is known about his famous painting. Experts aren't even sure who the woman in the painting was or who paid da Vinci to paint her portrait. The story of this painting is a great mystery. Encourage students to choose their favorite famous painting. Then have them conduct research to learn about the art, the artist and stories behind the famous piece of work. Instruct students to write a paper summarizing what they learned. Provide a variety of art supplies. Then give students time to create a reproduction of the artwork. Encourage students to be original, giving it their own personal spin. Invite students to present their artwork to the class. As they do, encourage them to read their summaries. Then have them explain how their reproductions emulate the original work but also exhibit their own personal twist. Prior to conducting this activity, select one famous painting for the class to investigate. Provide assistance as students conduct research. Divide the class into small groups and have each group write a brief summary about the artist and this particular piece of work. Then provide the necessary supplies and give students time to create their own reproductions. Compare and contrast the results. Have students complete the activity in small groups. Instruct each group to select a famous painting, conduct research and write a summary of the artist and this particular piece of work. Then provide the necessary supplies and have each group member create his or her own reproduction. When the group presents its work to the class, encourage each member to share one fact he or she learned about this famous painting. Divide the class into pairs. Encourage each pair to select one famous painting and conduct research to learn about the painting and the artist who created it. As partners write their summary, challenge them to include details that help viewers understand the subject matter and the story behind the painting. Provide the necessary supplies and have each partner create his or her own reproduction. Compare and contrast the results. Encourage each student to select a famous painting. Give them time to conduct research to learn about the painting and the artist who created it. Tell students to write a brief summary about the artwork and the artist. Instruct them to include information about the era when the painting was created and how that influenced the artist's work. Provide the necessary supplies and give students time to create reproductions that depict their own personal twist. Edvard Munch: Beyond "The Scream"
Though the Norwegian artist is known for a single image, he was one of the most prolific, innovative and influential figures in modern art. Read this Smithsonian magazine article to learn why. In this Smithsonian History Explorer activity collection, students analyze the work of two very different Mexican American artists, identifying aspects of culture and exploring expressions about Latino experiences in art. In this lesson from the Cooper-Hewitt, Smithsonian Design Museum, students will learn about the life and art of Piet Mondrian, his style influenced by jazz music and his technique using spatial concepts. Students will create a painting in Mondrian’s non-objective style. They will learn that art, music, design and math have connections we may not have thought about. In this activity from the Smithsonian’s History Explorer, students will learn about the culture of the Native American People of the Great Plains as they create their own buffalo hide paintings using a printable buffalo hide outline. Inspired by the Indians of the Great Plains, they will draw pictures of things that represent important events in their lives and their family’s history, or draw a hide with a geometric design. Read this Smithsonian magazine article to learn why a discovery in a remote part of Indonesia has scholars rethinking the origins of art—and of humanity. A new handheld tool lets scientists diagnose the chemical reaction behind “art acne”—and learn how it can be prevented. Read this Smithsonian magazine article to learn all about it.